On 24.07.2009, Friday, in Hill Clinic unique operations were done with the only one in Bulgaria GreenLight laser for treatment of enlarged prostate. The operations were done by Hill Clinic’s team, with the participation of doctor Steve Aldous, senior consultant in AMS (American Medical Systems). Few operations were done, absolutely bloodless, requiring only few hours hospital stay. The operations were 45 minutes each. The GreenLight laser is No 1 innovative solution for enlarged prostate treatment. In contrast to the classic operation – TURP, the GreenLight laser treatment is bloodless and there are no complications, the patient is back home in 24 hours. The GreenLight laser is last generation laser in the prostatic surgery that prevailed upon the diode laser technologies because the large number of procedures done and clinical researches confirmed the exceptional efficiency of the GreenLight technology. One of the main procedure advantages is that it preserves man’s sexual function. 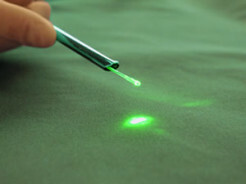 The GreenLight laser is first presented in October 2002 in UK and in May 2005 after clinical tests passed it is introduced in the highly specialized urological clinics. For this period of time the GreenLight laser treatment replaced TURP. According statistics there is no need of re-operation as well as the complications that accompany the classic prostate operations are minimized.